A business interview is nerve-wracking as it is. Before going into an interview, you spend time practicing, reading about the company, and reviewing every aspect of your resume. Another component that you should never overlook is the outfit, regardless of whether you are a man or a woman. Going into a business interview dressed for success will not only make your first impression count, but it will also improve your confidence and enable you to take control of the moment. The goal is to increase your prospect of getting a job, and with the dress tips below, you’ll be able to achieve that goal. The first and most cardinal rule for both men and women business dress is to avoid flashy and bright colors. A professional environment requires wearing clothes that are toned down. For example, some of the best colors to wear to a business interview are navy blue, black, white, grey, and maybe a tie or neckless that has one solid color. In addition, when choosing the interview outfit, avoid clothes that contain text. What you wear needs to be clean and solid. For both men and women, the dress jacket is an excellent way to empower yourself and to present yourself in a professional manner. Therefore, if you have an interview coming up, purchasing yourself a dress jacket that is stylish and that fits well will help you gain points during the interview. Again, the same color standard applies. When choosing a jacket, the fabric shouldn’t be textured, there should be no creative accentuations, and the color of the jacket needs to be solid and preferably within a toned down color scheme. If you would like to add some style to the jacket, cuff links are a good idea. 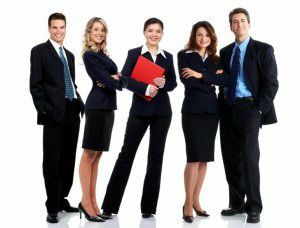 Unfortunately, there is a strong misconception that the type of shoes one wears to an interview doesn’t really matter. Regardless of whether you are a man or woman going into a business interview, you need to choose a pair of shoes that is mimics the image of a professional. For example, if you are a woman, opt for closed to mid-size heels in a solid color. On the other hand, if you are a man, then you should choose leather dress shoes that flatter what you are wearing. While it may seem like a business interview outfit is boring, there are still certain things that you can do to add some creativity and style to your outfit. For women, clean cut jewelry works as a great accent. For men, you can add some flare to your outfit by adding cufflinks or a beautiful tie. Overall, with the right outfit for your business interview, you’ll be able to feel confident and empowered to succeed at whatever questions your interviewers ask you, thereby helping you gain the job of your dreams. Make the right decision, always dress for success.